Duke, a literacy expert, researcher, and professor at the University of Michigan, discussed several studies that found teachers expectations influenced students’ actual performance and achievement (Dusek and Joseph, 1983) but that teachers held lower expectations for students of color and students from lower social classes (Tenenbaum and Ruck, 2007). Shifting to her own research, Duke illustrated the consequences of low expectations by discussing differences she’s seen in classrooms comprising mostly students of high socioeconomic status (SES) versus those with mostly students of low SES. For example, high SES classrooms have a greater volume of detailed print material that is prominently displayed and changed often. These classrooms more often display work created by students. Duke went on to explain three strategies to shift expectations. Duke cited “Reducing implicit racial preferences” in the Journal of Experimental Psychology for research on reducing racial preferences. Using 17 different interventions, the study sought to determine how to reduce implicit racial preferences to alleviate future discriminatory behavior. In her Not This But That book series, Duke and co-editor Ellin Oliver Keene, provide evidence-based alternatives to ineffective but popular teaching strategies. The series covers topics like teaching a letter a week, phonics and spelling worksheets, reading without differentiation, and problematic discipline methods. 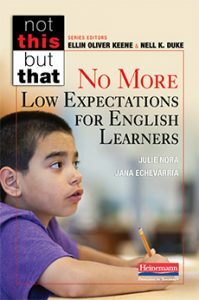 Duke particularly called out No More Low Expectations for English Language Learners as an example of challenging teacher expectations for literacy education. The mindset around teaching ELLs needs to be that bilingualism is an asset, not a deficit, says Duke, especially since the practices of discouraging bilingualism in the early years and then mandating foreign language courses in high school and college do not jibe. The last strategy Duke explained was her take on Project-Based Learning. Duke’s standards-aligned version of Project-Based Learning conveys high expectations of all students because the projects have implications for outside of school. Students feel like their voices are heard and their contributions matter. Read more about Dr. Nell Duke and download resources from her website.